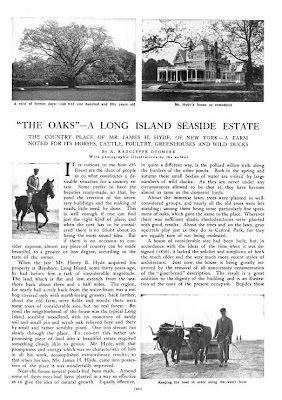 'The Oaks', originally named 'Masquetux' and built for Henry Baldwin Hyde by Calvert Vaux c. 1874 in Bay Shore and later owned by Hyde's son James Hazen Hyde. The elder Hyde was president of the Equitable Life Assurance Society of the United States. James Hazen Hyde was vice-president of the same company and vice-president of the National Bank of Commerce. The stick-style house was significantly altered by the younger Hyde c. 1900 and sold a few years later to Louis Bossert. 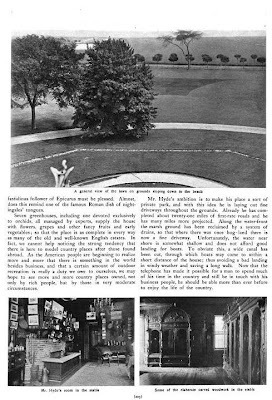 Bossert was the builder and owner of the Hotel Bossert in Brooklyn Heights as well as president of Bossert Lumber Co. and Louis Bossert & Sons, Brooklyn (sash manufacturers). 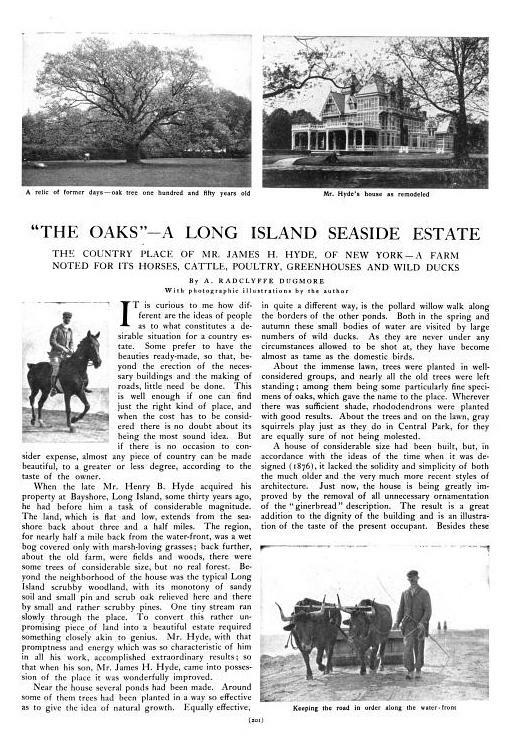 The house is extant but has been significantly altered to serve as the clubhouse for the Southward Ho Golf Course. Click HERE to see the property on bing. 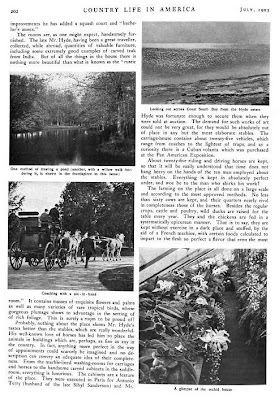 Photos from Country Life, 1903. Here is a great book about James Hazen Hyde. evidently the stable is still extant but how about that fabulous woodwork. if the house interior was 1/10 of the stable, it must have been really something. alas for the orchids and greenhouses. security word def - "reflitiv" - an unfortunately little used verb tense in which you wonder if you said the right thing. its use is illegal in the District of Columbia. The house still exists -- sort of. It's written up in Spinzia's South Shore book. Hyde's grandson Henry Baldwin Hyde II was a spy. There is an article about him on Spinzia's website. It is interesting about the chickens being confined and fed as some commercial growers do today. So much for an idyllic farm! 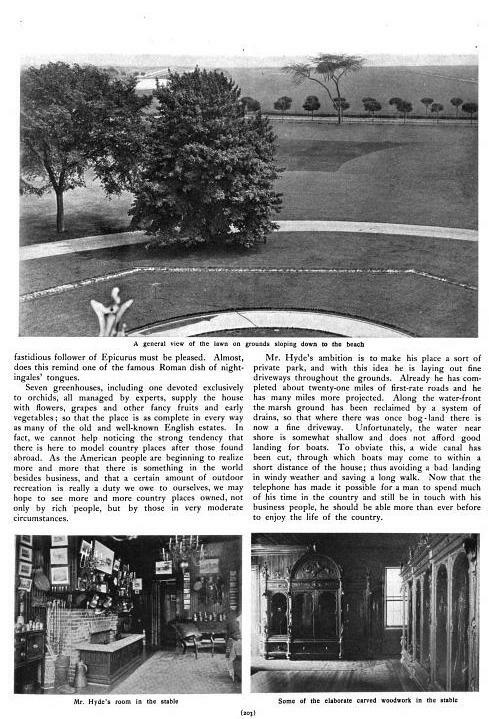 Somehow there's a connection between the book Mansions linked to & the comment Devoted just made about being idyllic -- I just can't articulate it. Too many remodelings etc. to see what survives of the original house (which was an okay stick-style house); but like TPR I hope a lot of that impressive woodwork made it. I believe the 1953 view has the house intact before the awful additions. Curious to know what property lies to the immediate west??? 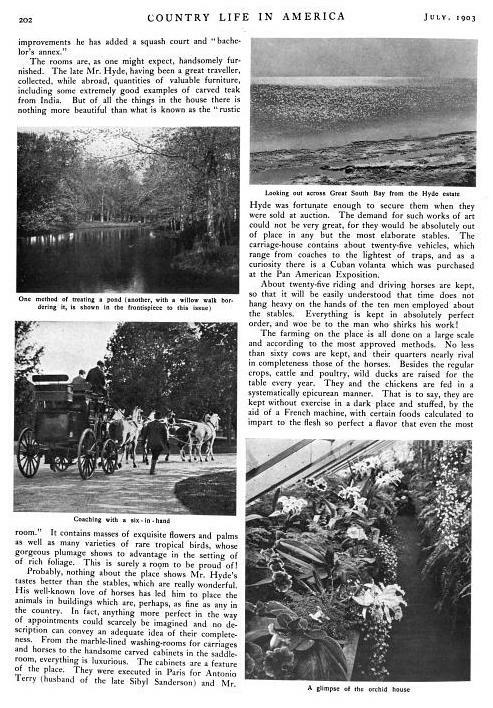 HPHS, in Historical Aerials if you jump from 1953 to 2004 I believe the main house on the property you're referring to is still there but is now the building used by the 'Southward Ho Golf Club' for their tennis courts & L-shaped swimming pool. This very large & good-looking house (reminds me a little of 'Spring Hill' in style) doesn't seem to have had nearly as many alterations as 'The Oaks.' I also hope at some point we find out who designed it & who built it. significantly altered to say the least!!! Would love to see the interiors.